According to Baymard Institute, a Denmark web research company, 67.45% of online shopping carts are abandoned. This means that when a customer is browsing through your website and decides to add an item to cart, there is a big chance they will not check out. They can abandon the cart half way, during the view cart or upon entering their address. AbandonedCarts is a product that helps you solve this. 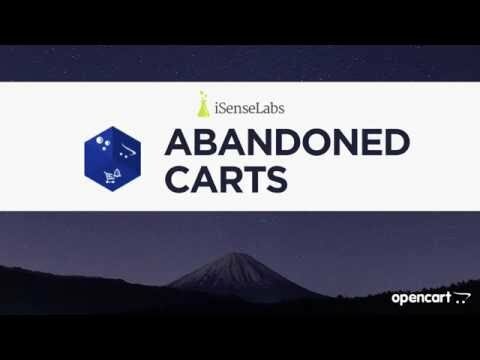 AbandonedCarts allows you to review your customer's abandoned checkouts, send an automatic or manual email with a link to their cart and/or provide a discount hook. ✯ Set up discounts - Fixed amount, percentage or no discount at all. AbandonedCarts can automatically create discounts which you can include in the emails. ✯ Discounts Options - Configure the validity of the discount codes. Choose between valid for all products in your store or the ones in your cart. ✯ Statistics - A statistics section gives you summarized information for all abandoned carts, coupons and most popular pages where carts are abandoned. ✯ Free shipping - Just like the OpenCart coupons functionality, AbandonedCarts allows you to offer free shipping together with each discount that you send. ✯ Track Conversions - A special conversions section will show you a detailed information for each abandoned cart that converted after the email notification. ✯ Dashboard Widget - Abandoned carts are crucial for your business. Add a widget in the dashboard of your store and keep a closer look to the abandoned carts. ✯ Cart Products - Include the products that are in the abandoned cart into the email notification that you send. * Please note that the advertised features are available for OpenCart 3.x an 2.x versions of the extension. As OpenCart 1.5.x is quite old, we do not actively implement features for it. If you are on OpenCart 1.5.x and looking for a specific feature, please check in the demo if it is included for your version of OpenCart. You can also refer to the release log of the product. Customer Name, Email, Telephone, Language and Registered/Guest customer status. Date & Time, Time spent on Website, Last Visited Page, IP and Language. Just about everything you need. You can set an automatic reminder for a customer or manually email a customer. Automated newsletters can be set days after a customer abandons their cart. 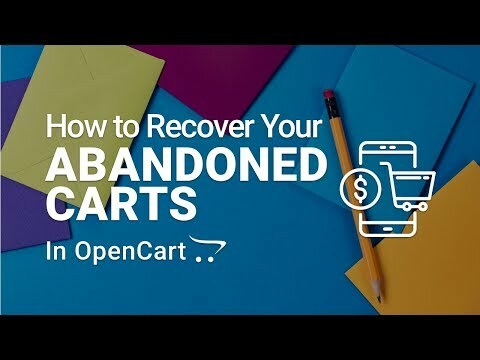 AbandonedCarts is following the default OpenCart functionality to apply discounts in the shopping cart, which makes it also compatible with all third-party checkout modules in the marketplace. Minimalistic, yet awesome. You can easily view and customize your email template according to the campaign you want to send. Did we also mention it is multilingual? AbandonedCarts generates unique discount codes to customers who have abandoned their carts. If you don't offer discount codes, that's okay, you can still send them a reminder email for their abandoned cart. AbandonedCarts OpenCart integration is fully compatible with 99.99% of the OpenCart themes. True story. Bundle up. Get AbandonedCarts and 105+ other OpenCart extensions and themes and save more than $2500. I have this module installed for the last days. Works magic, guys on support helped me tune it perfectly. Anyone that has an e-shop makes a crime not having this module. Already I have many orders from customers that I reminded them their left/forgotten shopping cart. Amazing! Really impressed with the quick response with the solution to my problem from the support team.